Find the perfect hotel for your stay in Rome - from discount and affordable Rome hotels for the budget traveler to luxury four star and five star Rome accomodations. You can also search for hotels in Rome that cater to your specific needs, such as extended stay hotels, hotels for business traveler / event planning, suite / boutique hotels and much more. Overlooking the panorama that has inspired visitors for centuries is Rome's most prestigious address - the Rome Cavalieri Hotel. Though only 15 minutes by car from the city's great monuments, the Rome Cavalieri has the tranquility of an oasis. Enclosed in fifteen acres of lush Mediterranean parklands, this luxury Hotel is a calm retreat in the heart of the Eternal City, an elegant refuge where time slows and hearts quicken. 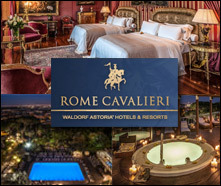 The first Hotel in Europe to be part of the exclusive Waldorf Astoria Hotels & Resorts, the Rome Cavalieri is more than just a 5–star property. It's the pre-eminent luxury Hotel in Rome, with an art collection that outshines many museums, a Grand Spa that would be the envy of a prestige health resort and with standards of luxury that set it apart from other Rome hotels. The Rome Cavalieri brings new meaning to notions of Italian style, and new purpose to the fine art of exclusive hospitality. An architectural renovation that brought history, glamour and design together in a unique, harmonious experience. Your boutique hotel in the heart of Rome. Visually and emotionally striking architecture and design bring out the soul of a historically important building. Staying at Leon's Place goes beyond ordinary hotel hospitality. It means enjoying exclusive hospitality, attentiveness and service in a splendid location, right near the famous Michelangelo gate, near the most important streets and sites of the world's most beautiful city. Once the aristocratic residence of the 16th century Princes of Torlonia, today the Hotel d'Inghilterra remains the preferred destination of the international elite, of those who appreciate its exquisite elegance, impeccable service and magnificent central location. Hotel d'Inghilterra is near to many of the vestiges of historical Rome: the Spanish Steps with its monumental stairway, the Trevi Fountain next to Palazzo Poli, the ancient Roman temple dedicated to the gods of Olympus known as the Pantheon, Villa Borghese and its Bernini sculptures, Galleria Borghese and the National Gallery of Modern Art. Hotel Ranieri downtown Rome is a perfect choice for your stay. For years this comfortable Rome hotel has been the ideal spot for those coming to the Eternal City for business or leisure. Created by combining a central location, 19th century umbertine style building, beautiful and functional guest rooms and personalized service. All these and more to make your memory of Rome a long and lasting one. Ranieri Hotel is an independent family owned and managed city center hotel in Rome with excellent location that allows you to reach the historical and archaeological sites of Rome, visit the museums and join the action of the business district or exciting roman street life. Right in the city center, around the corner from Piazza del Popolo and the Spanish Steps is one of Rome's most charming secret hideaways: Residenza di Ripetta. This oasis of peace and tranquillity is nestled in one of Rome's most famous former convents, a stunning 17th century structure. The marvellous views of the inner garden and the rooftops of Rome have won over the hearts of a select clientele that chooses to stay at the Residenza di Ripetta and consider it heir home when they visit the Eternal City. The Hotel Beverly Hills Rome is located in the prestigious Parioli neighbourhood with easy connections to the centre of Rome, the highways and airports. A short walk will take you to the natural beauty of Villa Borghese park, the wonderful art in the Borghese Museum, the National Gallery of Modern Art and the Dolce Vita of famous Via Veneto. A spacious and elegant reception hall with large glass doors, leather sofas and wood panelling welcomes guests to the Hotel Beverly Hills Rome. A superb base from which to explore the marvels of the Eternal City. Located on the enchanting Via Giulia, right in the heart of the historic centre of Rome, the hotel is just a short walk from Piazza Navona, Campo dei Fiori, Castel Sant' Angelo, St. Peter's Square, the Vatican Museums and the Sistine Chapel. The Hotel Indigo Rome - St. George is an environment rich in charm and history where Italian contemporary design is closed within ancient Roman walls. Welcome! The Holiday Inn Rome West hotel, a four star hotel fully renovated in May 2006. We are just few minutes away from St Peter s Basilica and the new Exhibition area (Nuova Fiera di Roma) and only 30 minutes from Rome Fiumicino International Airport.The Holiday Inn Rome West hotel has 237 rooms, with 38 new deluxe rooms and 5 junior suites. Guests have a free use of our mini gym, and outdoor pool (June -September) and can choose between free and pay car park. Our reception staff will be at your disposal to organize a private tour of Rome, while our free courtesy shuttle bus (leaves at prefixed schedules) will take you near P.za Venezia. Try our restaurant Alla Bella Italia where you can taste regional and international coucine accompained by a selection of doc wines. The Holiday Inn Rome West hotel is equipped with 16 dynamic and functional meeting rooms all with natural light, wi fi and hi tech instruments, ideal places for business meetings, work-shops and banquettes. Our new Olimpica meeting room can accomodate up to 340 delegates. The Holiday Inn Rome West hotel also disposes of a courtesy airport shuttle bus (twice a day at prefixed schedules) from/to Fiumicino International Leonardo da Vinci Airport. Welcome to Crowne Plaza Rome St Peter s Hotel, a four star superior hotel located in a beautiful residential area of Rome, a few minutes away from St Peter s Basilica, the Vatican City and the city centre. Crowne Plaza Rome St Peter s Hotel offers a wide range of services able to satisfy the needs of both business and leisure travellers. After conducting business in Rome or a long tiring tour of the eternal city relax at our St Peter s Spa, 900 sqm of leisure facilities inclusive of 25m length outdoor pool, indoor heated pool, sauna, Turkish bath, whirlpool, gym and tennis courts. The Spa will be closed twice a year: 2 weeks between July/August and 2 beginning of Jan for maintenance. Please note that children under 16 are not allowed except for outdoor pool. If you feel like hitting the town ask our Concierge what possibilities Rome offers and take advantage of our scheduled free courtesy bus. Visit our 'Osteria' for a casual meal or our gourmet restaurant Le Jardin d Hiver and enjoy great Italian food and wines. After dinner have a drink in our piano Bar Il Palco . Crowne Plaza Rome St Peter s Hotel boasts a Conference Centre with 13 flexible meeting rooms, exhibition area and outdoor spaces for banqueting events or to simply enjoy the beautiful weather of Rome during a coffee break. WiFi and high speed internet connection available throughout the hotel. The Belvedere Hotel is one of the oldest 3 stars Hotels of Lido di Ostia. Built at the beginning of the 20th Century, the hotel has retained its architectural features. Located on the Roman seafront, the hotel is 8 km away from Rome's International Airport of Fiumicino 'Leonardo da Vinci', 13 km from the New Rome's Fair Center, 3 km from the Ostia Antica Archaeological site, 2 km from the Natural Park of Castelfusano, and 25 km from Rome's city centre. Thanks to its exceptional position, the hotel can offer a resting and unforgettable stay: for relaxing evenings you could walk on the seafront promenade, or enjoy the wonderful seaview from your own room or from the hotel's panoramic terrace. Ostia Antica Park Hotel, a new hotel recently built, situated between the popular tourist archaeological resort of Ostia Antica area and the sea of Rome (Ostia Lido), only 10 km from the 'Leonardo da Vinci Fiumicino' Airport and about 12 km from the complex of the New Rome Fair. It is an ideal location for the organization of Meetings, Parties, Events and Weddings. The lovely evergreen gardens create an impressive scenario suitable for all types of meetings, conventions or banquets. In our hotel you will find the OTIUM SPA, a new and modern wellness center with sauna, showers, turkish bath, whirlpool, relaxation area and tea room. To complete your relaxation, the hotel offers also a solarium and a swimming pool in the garden connected to the SPA. The Hotel Internazionale, a 4 star Boutique hotel of 42 rooms is situated in the Centre of Rome, in the prestigious Via Sistina, very near to the Spanish Steps, the famous Via Veneto and the Trevi Fountain. The great charm of the hotel originates not only from the location, but also from the presence of numerous archaeological pieces perfectly preserved in the building, which is equipped with every modern comforts. The hotel also has a wonderful fitness room and a terrace where you can spend relaxing moments, enjoying the view over the rooftops of Rome. An experience in the heart of an Ancient City, unique for charm and history, in a hotel where tradition and elegance come together in a mix of pleasure and excellence in the service; all elements that have allowed the Hotel Internazionale to be recognized, by the prestigious German organization TUV, the ISO 9001:2000 Quality Certification and, as the first and only hotel in Rome, the Certification UNI 10670:1997 Quality of Service for the Hotel Business.